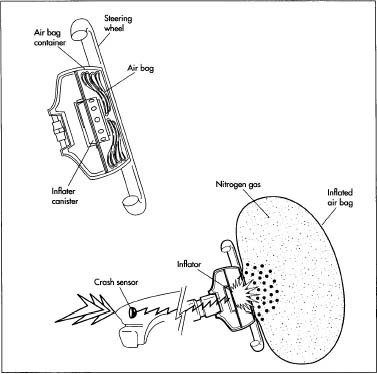 A typical air bag system consists of an air bag module (containing an inflator or gas generator and an air bag), crash sensors, a diagnostic monitoring unit, a steering wheel connecting coil, and an indicator lamp. These components are all interconnected by a wiring harness and powered by the vehicle's battery. Air bag systems hold a reserve charge after the ignition has been turned off or after the battery has been disconnected. Depending on the model, the backup power supply lasts between one second and ten minutes. Since components vital to the system's operation might sit dormant for years, the air bag circuitry performs an internal "self-test" during each startup, usually indicated by a light on the instrument panel that glows briefly at each startup. The crash sensors are designed to prevent the air bag from inflating when the car goes over a bump or a pothole, or in the case of a minor collision. The inflator fits into a module consisting of a woven nylon bag and a break-away plastic horn pad cover. The module, in turn, fits into the steering wheel for driver's-side applications and above the glove compartment for front passenger applications. In a frontal collision equivalent to hitting a solid barrier at nine miles per hour (14.48 kilometers per hour), the crash sensors located in the front of the car detect the sudden deceleration and send an electrical signal activating an initiator (sometimes called an igniter or squib). Like a light bulb, an initiator contains a thin wire that heats up and penetrates the propellant chamber. This causes the solid chemical propellant, principally sodium azide, sealed inside the inflator to undergo a rapid chemical reaction (commonly referred to as a pyrotechnic chain). This controlled reaction produces harmless nitrogen gas that fills the air bag. During deployment the expanding nitrogen gas undergoes a process that reduces the temperature and removes most of the combustion residue or ash. The expanding nitrogen gas inflates the nylon bag in less than one-twentieth (1/20) of a second, splitting open its plastic module cover and inflating in front of the occupant. As the occupant contacts the bag, the nitrogen gas is vented through openings in the back of the bag. The bag is fully inflated for only one-tenth (1/10) of a second and is nearly deflated by three-tenths (3/10) of a second after impact. Talcum powder or corn starch is used to line the inside of the air bag and is released from the air bag as it is opened. A typical driver's-side air bag fits neatly on the steering wheel column. In case of a collision, the crash sensor sends an electric spark to the inflator canister, setting off a chemical readion that produces nitrogen gas. The gas expands, inflating the air bag and protecting the driver. were large and bulky, primarily using tanks of compressed or heated air, compressed nitrogen gas (N 2 ), freon, or carbon dioxide (CO 2 ). Some of the early systems created hazardous byproducts. One particular system used gun-powder to heat up freon gas, producing phosgene gas (COCl 2 )—an extremely poisonous gas. One of the first patents for automobile air bags was awarded to industrial engineer John Hetrick on August 18, 1953. Conceived by Hetrick after a near accident in 1952, the design called for a tank of compressed air under the hood and inflatable bags on the steering wheel, in the middle of the dash-board, and in the glove compartment to protect front seat occupants, and on the back of the front seat to protect rear seat passengers. The force of a collision would propel a sliding weight forward to send air into the bags. Many other inventors and researchers followed suit, all exploring slightly different designs, so that the exact technical trail from the early designs to the present system is impossible to note with certainty. In 1968, John Pietz, a chemist for Talley Defense Systems, pioneered a solid propellant using sodium azide (NaN 3 ) and a metallic oxide. This was the first nitrogen-generating solid propellant, and it soon replaced the older, bulkier systems. Sodium azide in its solid state is toxic if ingested in large doses, but in automotive applications is carefully sealed inside a steel or aluminum container within the air bag system. 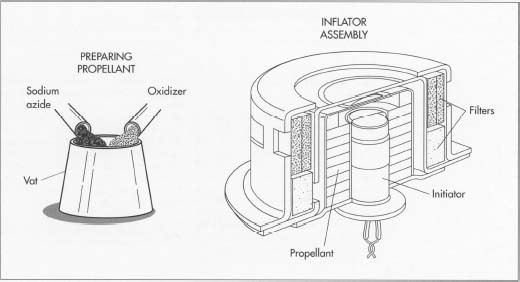 Preparation of the propellant, the first step in air bag manufacture, involves combining sodium azide and an oxidizer. The propellant is then combined with the metal initiator canister and various filters to form the inflator assembly. another study conducted in 1989 by General Motors, the combination of lap/shoulder safety belts and air bags in frontal collisions reduced driver fatalities by 46 percent and front passenger fatalities by 43 percent. In response to consumers' increased safety concerns and insurance industry pressure, the federal government has forced automobile manufacturers to upgrade their safety features. First, Department of Transportation (DOT) regulations require all cars, beginning with model year 1990, sold in the United States to be equipped with a passive restraint system. (Passive restraint systems—requiring no activation by the occupant—involve the use of automatic seat belts and/or the use of air bags.) If car manufacturers choose an air bag, then regulations require only a driver' s-side system until model year 1994, when air bag-equipped cars must include passive protection on the passenger's side as well. A 1991 law requires driver and passenger air bags in all cars by the 1998 model year and in light trucks and vans by 1999. As stated above, an air bag system consists of an air bag module, crash sensors, a diagnostic monitoring unit, a steering wheel connecting coil, and an indicator lamp. 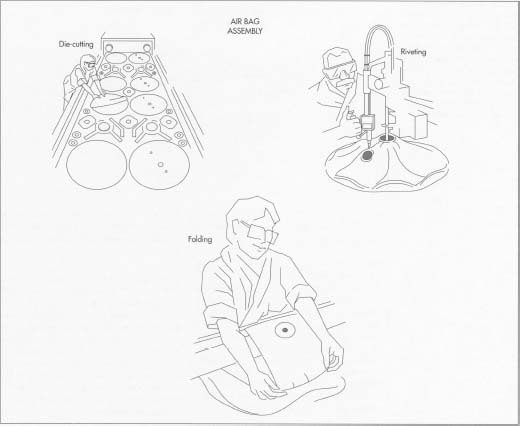 Both this section and the next ("The Manufacturing Process") will focus on the air bag module itself. An air bag module has three main parts: the air bag, the inflator, and the propellant. The air bag is sewn from a woven nylon fabric and can come in different shapes and sizes depending on specific vehicle requirements. The driver's-side air bag material is manufactured with a heat shield coating to protect the fabric from scorching, especially near the inflator assembly, during deployment. Talcum powder or corn starch is also used to coat the air bag; either substance prevents the fabric from sticking together and makes it easier to assemble. Newer silicone and urethane coated air bag materials require little or no heat shield coating, although talcum powder or corn starch will probably still be used as a processing aid. 4 The inflator components, such as the metal canister, the filter assembly—stainless steel wire mesh with ceramic material inside—and initiator (or igniter) are received from outside vendors and inspected. The components are then assembled on a highly automated production line. 5 The inflator sub-assembly is combined with the propellant and an initiator to form the inflator assembly. Laser welding (using CO 2 gas) is used to join stainless steel inflator sub-assemblies, while friction inertial welding is used to join aluminum inflator sub-assemblies. Laser welding entails using laser beams to weld the assemblies together, while friction inertial welding involves rubbing two metals together until the surfaces become hot enough to join together. The air bag parts are die-cut out of woven nylon, sewn together, and riveted. The bag is then carefully folded so that it will fit inside the plastic module cover. Propellants, before being inserted into inflators, are first subjected to ballistic tests to predict their behavior. A representative sample of inflators are pulled from the production line and tested for proper operation by a full-scale inflator test, which measures pressure—created by the generated gas inside a large tank 15.84 or 79.20 gallons (60 or 300 liters)—versus time in milliseconds. This gives an indication of the inflator system's ability to produce an amount of gas at a given rate, ensuring proper air bag inflation. The air bags themselves are inspected for fabric and seam imperfections and then tested for leaks. Crash sensors can be located in several spots on the front of the automobile. These sensors are connected to the air bag module with a wiring harness. 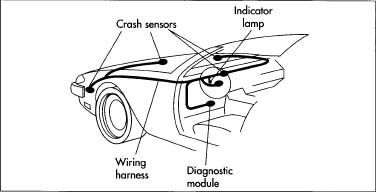 Two other key components of an air bag system are the diagnostic module and the indicator lamp. The diagnostic module performs a system test each time the car is started, briefly lighting up the indicator lamp mounted on the dashboard. and lighter in weight; will involve smaller, more integrated systems; and will use improved sensors. Side-impact air bags are another possibility that would work similar to driver- and passenger-side air bags. Side-impact air bags will most likely be mounted in the car door panels and deployed towards the window during impact to protect the head. Foam padding around the door structure would also be used to cushion the upper body in a side impact. Head and/or knee bolsters (energy absorbing pads) to complement the air bag system are also being investigated. Rear-seat air bags are also being tested but consumer demand is not expected to be high. A hybrid inflator is currently being tested that uses a combination of pressurized inert gas (argon) and heat from a propellant to significantly expand the gas's volume. These systems would have a cost advantage, since less propellant could be used. Air bag manufacturers are also developing systems that would eliminate the sodium azide propellant, which is toxic in its undeployed form. Work is also underway to improve the coatings that preserve the air bag and facilitate its opening. Eventually the bags may not need coatings at all. In the future, more sophisticated sensors called "smart" sensors will be used to tailor the deployment of the air bag to certain conditions. These sensors could be used to sense the size and weight of the occupant, whether the occupant is present (especially in the case of passenger-side air bags where deployment may be unnecessary if there are no passengers), and the proximity of the driver to the steering wheel (a driver slumped over the steering wheel could be seriously injured by an air bag deployment). Chaikin, Don. "How It Works—Airbags," Popular Mechanics. June, 1991, p. 81. Frantom, Richard L. "Buckling Down on Passenger Safety," Design News. October 2, 1989, pp. 116-118. Gottschalk, Mark A. "Micromachined Airbag Sensor Tests Itself," Design News. October 5, 1992, p. 26. Grable, Ron. "Airbags: In Your Face, By Design," Motor Trend. January, 1992, pp. 90-91. Haayen, Richard J. "The Airtight Case for Air Bags," Saturday Evening Post. November, 1986. Reed, Donald. "Father of the Air Bag," Automotive Engineering. February, 1991, p. 67. Sherman, Don. "It's in the Bag," Popular Science. October, 1992, pp. 58-63. Spencer, Peter L. "The Trouble with Air Bags," Consumers' Research. January, 1991, pp. 10-13. Conventional Airbags (located in the dashboard/steering wheel) deploy only when the front of that vehicle is sufficiently damaged to activate the sensor(s). Rear-end collisions are mitigated by headrests (and in some cases, active head restraints such as SAAB's SAHR and Mercedes-Benz's Neck-Pro). or would hurt the person even more? Is it Different in Airline Emergency Air Bags. What materials do I need to manufacture my on airbag igniter in my garage?